K.A. Libby's Blog | A novel enterprise. Excerpt from Chapter 1 of “Beware the Sleeping Dog” by k.a. libby. When I moved back to mid-coast Maine, my life seemed perfect. I’d slammed the door on my not-so-recent past and left my troubles behind. Or so I thought until my mechanic shattered that illusion. She told me there was a global positioning device mounted inside my Jeep’s left front wheel well. Apparently someone was tracking me. Suddenly the strange things that had happened to me over the past few days—and that I’d dismissed as coincidence or just plain bad luck—didn’t seem so random. The GPS was intentional and personal. First, evaluate your daily schedule. Find at least 15 minutes of every day—that’s right, every day—to dedicate to writing. Whether it means you have to wake up 15 minutes earlier, go to bed 15 minutes later, eat lunch faster, take a notepad into the bathroom—whatever it takes, you have to make time to write. It’s the one and only definitive prerequisite to being a writer. Another option that works for me is to set the timer for 45 minutes. Write until it goes off, get up from your computer, and take a fifteen minute break doing something completely different. You’ll return full of energy and enthusiasm. I promise. The 45/15 rule for writing. Recently I read that one particularly productive author (I don’t remember who!) sets a timer for 45 minutes and then writes during that block of time. When the timer goes off, she steps away from her computer and does some totally unrelated task. It works! I’ve tried it. I seem to write with more energy in shorter blocks. The 15 minute rule for writing. Then I read the reverse. Write for 15 minutes, then return to the other demands of life. That works as well. There are times when I am overwhelmed with all the day-to-day must-do’s or just plan wanna-do’s. But even then I can convince myself to spend 15 minutes with focused writing. Just write! The important thing is to write. Write. Write. Every day. Little bits of progress are preferable to NO progress. So sit down at your computer. Think and type and marvel. Then enjoy a cup of coffee. Go to work. Mow the grass. Walk the dog. Ride your bike. Or even take time for a good night’s sleep. You’ll be ready—even eager—to write for another 15 or 45 minutes. I read somewhere that an author should read 10,000 words for every 1,000 she writes. Imagine, a job that encourages … no, mandates! … that I read. Perfect. Speaking of perfect, my husband Wayne Reidinger took this photo from our back yard. A perfect rainbow. And the pot at the end of this rainbow for me: Completion of my second mystery. Not quite there yet, but enroute. In the meantime, I can read. Read! And read. No More Procrastination in 2016! I’m putting this to practice and moving ahead with my manuscript in 2016. My exuberant but gentle Swee’Pea celebrates this resolution with a high five. Pipsqueak is a little more cautious, waiting to see how I proceed before she celebrates. In any event, here’s to an amazing and productive 2016 for all of you reading this message. The sun rises big and orange through the early morning mist. In that instant I have a flash of insightful awareness: never apologize for self-publishing. It is an art and a gift. (Photography credit: Wayne Reidinger). Self-publishing allows an author to put his/her work out there for the pleasure of others without the pressure of an editor’s deadline for the next book. A manuscript is like a fine wine that grows in richness and flavor with time and patience. You cannot–must not–rush the process. 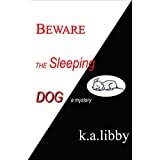 Lynda Purinton of New Gloucester, ME, says of Beware the Sleeping Dog self-published under my plum de nom K.A. Libby: I so enjoyed (the book). I was hooked at the first paragraph. I didn’t figure out who the villain was and look forward to reading more. You are amazing! In this picture I’m a dot amidst the golden glory of fall. For me it represents my progress on my second novel. Pedaling along. Stroke by stroke. Like my manuscript: A sentence. A scene. A chapter at a time. And I say to you, my fellow authors, every word moves you closer to your goal. And sometimes your downtime is as important as your writing time. A challenge is how to make that non-writing time serve your writing time. I do it by reading in my genre and by embracing nature. I write about the State of Maine and its people and its environment. Thus when I return from a visit there I am energized and ready for a fresh restart on my current novel. I traveled there and back with Wayne and his camera. I have two vignettes to share with you that capture the hold which Maine has on my heart. The first is a rare up close and personal osprey moment at Wolf’s Neck Woods State Park. While Wayne clicked the shots, I stood in wonder watching the show. A parent osprey came bearing a gift for the family. 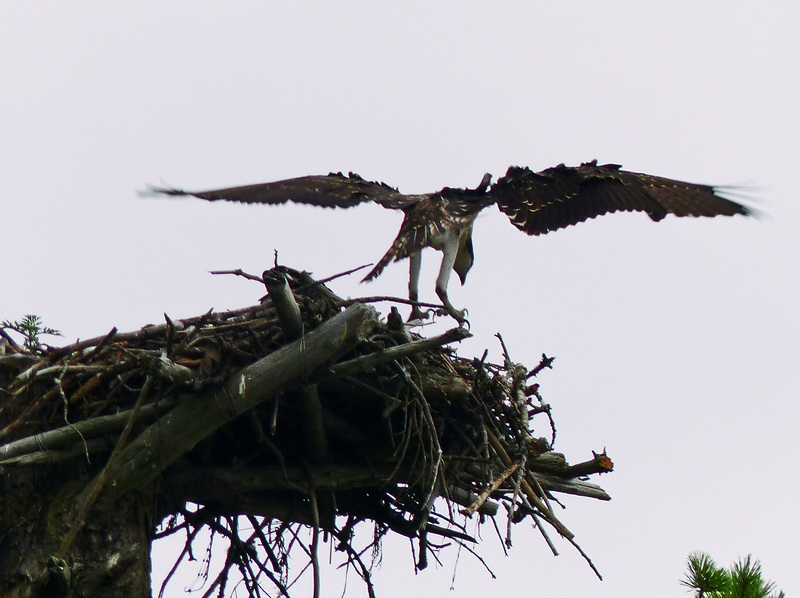 Then one of the nestlings tested his wings with a hop and skip midair on the nest edge. He decided against fledging at the last minute. But I’m betting he took flight before the day was done. That testing and reconsidering is somewhat like the debut author considering submitting her/his novel. I’m ready! I’m ready. But not today. A worthy novel is like a good wine. It needs time to age to its full bodied flavor. And often a little more editing and refining is required to reach that point. The next vignette: Walking far out on the low-tide shoal in that sweet spot between Spinney’s and Popham Beach. Wayne captures me in a moment of bliss at the edge of the Atlantic … actually surrounded by the Atlantic. No one else in sight. Alone. Inspired. Much like writing. Sitting at my computer. Alone. No one else can write my book for me. There were other moments as well–not documented but seared in my memory. Precious time spent with my sister and brother. Welcome visits with my nieces Rebecca and Karen. A Lexi manicure–I could see the woman-to-be in the graceful lines of her thirteen-year-old-face. A boisterous lunch with some very special members of the Libby clan. Aah. Maine.